Public opinion about the death penalty has changed only modestly in recent years, but there continues to be far less support for the death penalty than there was in the mid-1990s. A survey by the Pew Research Center for the People & the Press and the Pew Forum on Religion & Public Life, conducted Nov. 9-14, 2011, among 2,001 adults, finds that 62% favor the death penalty for people convicted of murder while 31% are opposed. That is generally in line with polling on the death penalty over the past several years. 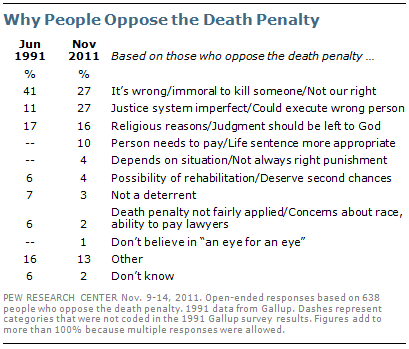 During the mid-1990s, when the Pew Research Center first surveyed on this issue, support for the death penalty was at a historic high point. In 1996, 78% favored capital punishment for people convicted of murder. Support for the death penalty subsequently declined, falling to 66% in 2001 and 62% in late 2005. Since then, support has mostly remained in the low-to-mid-60s, though it dipped slightly (to 58%) in October 2011. 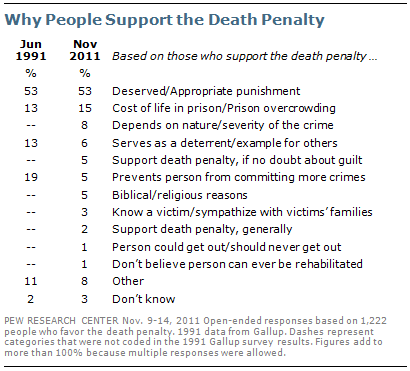 When Gallup first asked about the death penalty in 1936, 59% registered support for the policy. This fell to an all-time low of 42% in 1966, which was the only time over the course of 75 years in which there was more opposition (47%) than support. 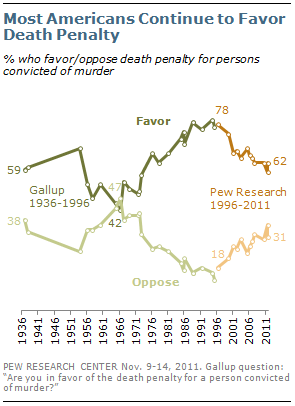 Gallup’s trend showed that support for the death penalty grew again over the course of the 1970s and 1980s and peaked in the mid-1990s. When asked why they oppose the death penalty, 27% of opponents say it is wrong or immoral to kill someone, while an identical percentage (27%) cite concerns about flaws in the justice system and the possibility that innocent people could be put to death. In a Gallup survey 20 years ago, when just 18% opposed the death penalty, a much higher percentage of death penalty opponents (41%) cited moral considerations and there were far fewer mentions of problems with the justice system or wrongful executions (11%). The majority of Americans who support the death penalty today offer largely the same reasons that supporters gave 20 years ago. Roughly half (53%) say the punishment fits the crime or that it is what murderers deserve. A smaller share raises concerns about the costs of keeping murderers in prison for life (15%). Relatively few death penalty supporters cite deterrence (6%) or keeping murderers from committing more crimes (5%) in explaining their position. The death penalty continues to draw much more support from whites (68%) than from African Americans (40%). Among Hispanics, 52% favor the death penalty for people convicted of murder while 42% are opposed. Large majorities of conservative Republicans (84%) and moderate and liberal Republicans (73%) support the death penalty, as do 64% of independents. Among Democrats, conservatives and moderates favor the death penalty by 55% to 37% while liberals oppose it by about the same margin (54% to 40%). Majorities of major religious groups, except for black Protestants, favor the death penalty for people convicted of murder. Roughly three-quarters of white evangelical Protestants (77%) and white mainline Protestants (73%) support the death penalty. Somewhat fewer white Catholics (61%), Hispanic Catholics (57%) and the religiously unaffiliated (57%) favor capital punishment for convicted murderers.